Firefighters battled several fires in Colorado in June 2012, with the conflagrations destroying huge amounts of acreage and hundreds of homes. GOLDEN, Colo. — Wildfires that are still raging in Colorado have devastated tens of thousands of acres and destroyed hundreds of homes, bringing calls for the marshaling of local, state and federal resources to combat the infernos. 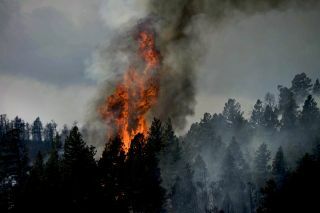 In the Waldo Canyon blaze alone, hundreds of firefighters fought the most destructive wildfire in Colorado's history. The out-of-control blaze, at its peak, forced the evacuation of 32,000 people. One potential tool that could help in early and automated detection of future conflagrations is based on space sensor know-how. The FireWatch early warning detection system is based on technology honed by the German Aerospace Institute. Over several years, the institute has collected experience in fire monitoring using different platforms and assorted sensors. Instead of analyzing a comet's emission of gas and particles in space, a terrestrial fire-detection application makes use of high-resolution optical sensors — this time, installed on towers or masts that connect to a remote central office to monitor forests and detect potential fires. A key to making this feasible is the high-resolution sensor's use of more than 16,000 gray tones. That enables the system to detect the smallest variations in light intensity, just right in connection with smoke generated by forest fires. FireWatch technology is based on German space sensor know-how. The project was supported by the DLR Technology and Marketing Division. In 2001, the system was introduced to the market and further developed by an industrial partner — IQ wireless GmbH in Berlin, Germany. FireWatch image-processing software analyzes the motion, structure and brightness of smoke plumes and automatically alerts monitoring personnel within six minutes during daylight and within 12 minutes during nighttime. Monitoring personnel receive target images and coordinates to determine and alert the appropriate response resources. Established networks of the high-resolution cameras can each monitor hundreds of square miles of forest. FireWatch now protects more than 7 million acres of forests around the world from Europe and Australia to Mexico. According to the DLR, nearly 100 percent of endangered German forests are watched by FireWatch. About 180 systems are operational in Brandenburg, Mecklenburg-Vorpommern, Sachsen, Sachsen-Anhalt and Niedersachsen. (L to R) NASA representative Daniel Lockney; DLR inductee, Ekkehard Kuehrt, asteroids and comets department head, Institute of Planetary Research; and Space Foundation Special Adviser - Human Spaceflight, former NASA astronaut Leroy Chiao. FireWatch was inducted last April into the Space Foundation's Space Technology Hall of Fame in Colorado Springs, which is, coincidentally, near the location of the huge Waldo Canyon fire. The hall of fame was established in 1988 to increase public awareness of the benefits that result from space exploration programs and to encourage further innovation. "These inductees are extraordinary examples of how space research and development can, eventually, make our lives on Earth safer, more comfortable and more environmentally sustainable," Kevin Cook, Space Foundation director of Space Awareness Programs, said during induction ceremonies. The induction of FireWatch, Cook said, underscores the increasing globalization of space. "As our first purely international honoree, this technology shows how other nations are developing and deploying space technologies." A U.S. Air Force C-130 Hercules aircraft uses a modular airborne firefighting system to spread fire retardant on the Waldo Canyon wildfire in Colorado Springs, Colo., on June 28, 2012. The Waldo Canyon fire, which started June 23, has burned several hundred homes and forced large-scale evacuations in Colorado Springs. Marketing of the fire detection technology in the United States has just begun. "We're a new company that is rolling out the technology and product in the U.S. and Canada," said Joe Turnham of FireWatch America LLC, based in Auburn, Ala.
Turnham said that the firm hopes to have a permanent demonstration project up and running by year's end. The company points out that there are new realities of wildfire. Among those realities is prolonged and severe drought; increasing forest fuel loads; invasive species; consistent winds; dry-lightning; longer fire seasons; arson; and new terrorism threats, as well as the fact that one in three homes are now in the wildland-urban interface (defined as human development that is close to, or within, natural terrain). There's also growing public resistance to prescribed burning while state and federal budgets are being squeezed. A U.S. Forest Service aircraft breaks away, top, as a Modular Airborne Firefighting System-equipped C-130 aircraft begins dropping flame retardant on a section of the Waldo Canyon fire near Colorado Springs, Colo., on June 26, 2012. FireWatch is proven technology, the company points out, that has been deployed and perfected over eight years in the field. "The cost of deployment is less than $3 per acre and can be up and running in less than 120 days," Turnham said. "It spots small smoke plumes of 10 meters at distances up to 20 miles and can see in the dark." Most events are spotted in less than 12 minutes, Turnham said, and specially created software tells emergency officials exactly where the smoke is located. The technology has reduced the acreage burned in Germany by nearly 90 percent, Turnham said. "In Colorado, the technology could spot fires early and give firefighters a chance to stop major infernos," he told SPACE.com.